I’ve been pretty harshly critical of the Harry Potter films over the years. Mostly they’re adequate at best, and just bad at worst. However, I maintained a minimal interest in the Fantastic Beasts and Where to Find Them spin-off. My logic was that with nothing to compare it to, there was less potential for disappointment. Even so, I wasn’t expecting a lot. I went in anticipating a popcorn movie with some pretty special effects, and no more. Fantastic Beasts and Where to Find Them turned out to be a far deeper, more mature, and more powerful story than I expected. Fantastic Beasts begins with Newt Scamander, author of the book the film is named for, as he arrives in New York with an enchanted trunk full of magical creatures. This is a rather illegal thing to do, given the American wizarding government thinks rather poorly of fantastical creatures and general prefers to hunt them rather than preserve them. And it doesn’t take long for him to run into trouble. When several of his creatures break free, Newt runs afoul of disgraced auror Tina Goldstein, who apprehends him for endangering the secrecy of magic. Along the way, he also becomes entangled with Tina’s sister, a boisterous mind-reader named Queenie, and Jacob Kowalski, a local muggle (or “no-maj” as the Americans like to call them) who has seen far too much. Newt’s mishaps couldn’t have come at a worse time, either, as a string of magical calamities throughout New York have inflamed the already high tensions between the magical and mundane worlds. It doesn’t take long for the authorities to blame Newt and his animals, but he knows they can’t be to blame, and he and his newfound allies must work fast to recapture them and prove their innocence. 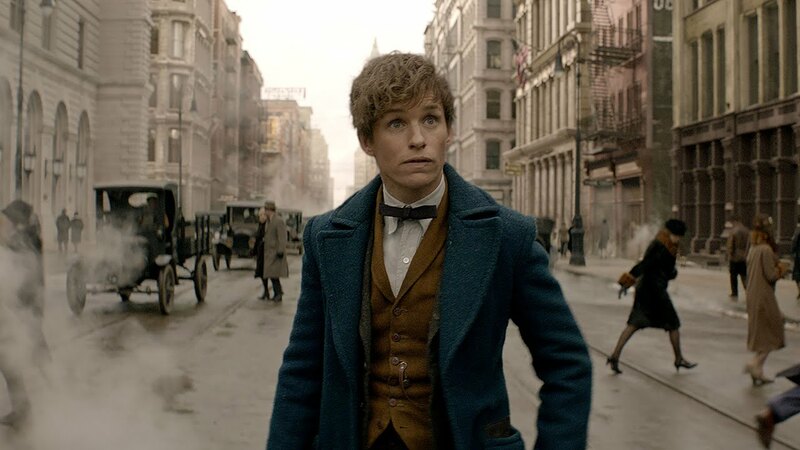 If I have a complaint about Fantastic Beasts, it’s that there’s this weird disconnect between the whacky and whimsical quest to wrangle Newt’s critters and the surprisingly intense geopolitical/magical concerns that end up forming the real meat of the story. It’s sort of two movies at once, and the one it advertised itself — the one about Newt and his animals — is a lot less interesting than the other one. 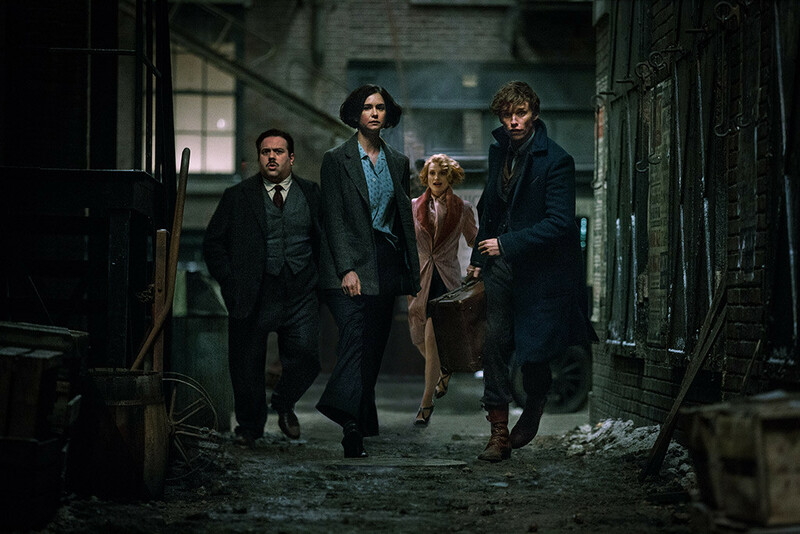 Similarly, Newt himself is kind of weak compared to Tina’s pure-hearted determination, Jacob’s humble lovability, and Queenie’s flirtatious charm. There is something to be said for a hero who solves problems with knowledge, understanding, and compassion rather than brute force, and intellectually I appreciate what Newt represents, but the fact is he just doesn’t have the charisma or charm of the rest of the cast. Come to think of it, this is kind of a hallmark of J.K. Rowling’s work. Harry himself was one of the least interesting characters in the Harry Potter books. Even in the Cormoran Strike novels, I like Robin and Shanker a lot more than I like Cormoran. But I said Fantastic Beasts is like two movies at once, and it’s the other one, the one about the friction between magic and mundane in New York, that’s special. What really impressed me about Fantastic Beasts is how incredibly heavy a lot of the themes it deals with are: segregation, conservation, religious extremism, child abuse, bigotry and what it does to people. In retrospect, I maybe shouldn’t be surprised. I’m always telling people how smart and mature the Harry Potter books are. I just didn’t expect Fantastic Beasts to follow in that tradition. Part of it is probably down to the fact I didn’t follow the movie’s production very closely. I was of the impression J.K. Rowling had simply tossed out some general ideas and then gone home to cash her cheque while the movie studio did the rest. I didn’t realize she’d written the entire screenplay herself. That explains a lot. I want to be even more careful with spoilers than I usually am here because I think Fantastic Beasts is one of those stories that’s much better if you go in fresh and watch it evolve naturally. I will say that it’s a very powerful movie, and that what the threat actually turns out to be is both conceptually brilliant and genuinely terrifying. I also think the villain of this series has the potential to be much more interesting than Voldemort was. Not so much due to anything inherent to the character as the way the series is showing the rough edges of where the magical and mundane worlds meet in Rowling’s universe. Voldemort just felt evil for evil’s sake, but this character reminds me more of X-Men’s Magneto — someone with legitimate anger over the world’s injustices who has taken that anger too far. The ending of the film is a little underwhelming in some ways — it’s what we in my family liked to call a “Voyager Ending” in honour of Star Trek: Voyager’s ability to always resolve any crisis in the last five minutes, logic be damned. But it’s not enough to spoil an otherwise excellent experience. Overall rating: 8.9/10 Vastly better than I expected. Also, now I’ve dug out my copy of Fantastic Beasts and Where to Find Them to read more about the critters in the movie. This entry was posted in Reviews and tagged fantasy, Harry Potter, movies, review by Tyler F.M. Edwards. Bookmark the permalink. I agree with you about the main character! I felt like they didn’t develop him very well in the movie. It’s funny you mention Harry Potter also being the most “boring” in the stories, because I hadn’t really thought of that but it’s so true! Yeah, which is interesting because I think that’s a common problem in fiction. You base your story around an everyday “hero” while the supporting characters are allowed to be out-there. I guess the concern is creating a protagonist who people can relate to, but definitely the characters who are out-there are more memorable, and I find myself drawn to some of them! Also, like when two side characters have a romance in a TV show that ends up being way more interesting than the main romance… I know I’ve seen that in a lot of teen dramas I used to watch, back in the day. I wouldn’t say that’s universally true, but it can be a potential pitfall, for sure. Come to think of it I tend to prefer the secondary characters in Ian Irvine’s work, too — especially the early books. Funnily enough, I have the opposite problem in my own writing. I often get so passionate about one protagonist I forget about the others and they end up kind of unfinished. I call it the Leha Effect.